This is such an important topic, I can’t believe I haven’t shared it here on the blog! I recently got a request from one of my lovely subscribers, Sonia Guzman, to share my tips on how I clean my makeup brushes. Thanks for the request Sonia! Cleaning your brushes is key, since brushes hold a lot of bacteria and build up. Clean brushes are an easy way to make sure that your complexion stays clear and fresh, while dirty brushes can lead to breakouts. I try and keep my brushes as clean as possible, especially since I like to switch between products and palettes. 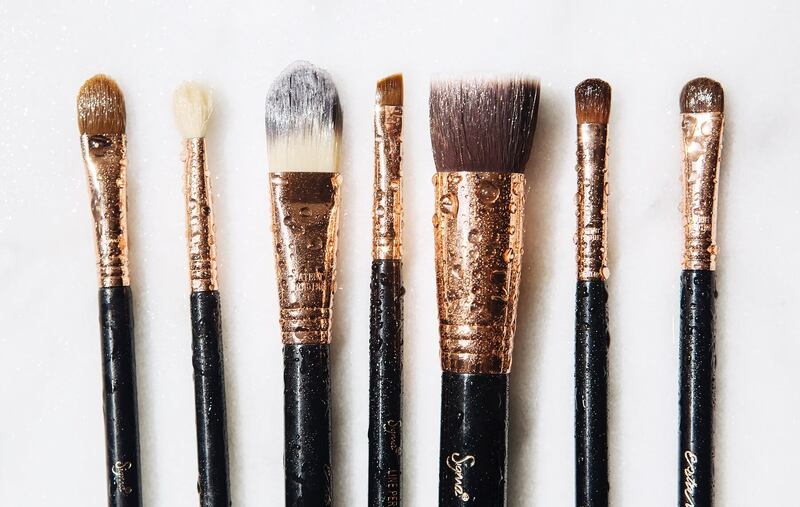 Here are my tips for cleaning makeup brushes —I’ve broken this how-to into three sections for face brushes, eye brushes, and beauty blenders. If you use your face brushes every day, you should wash them at least once a week. I sometimes even wash them twice! These are the most important brushes to clean, since you use them on your face and they can spread oil and bacteria on your skin. To wash my face brushes I like to use a gentle shampoo that doesn’t have a lot of harsh chemicals, (baby shampoo works great) and a Sigma Brush Cleaning Glove (you can use the code SIMPLYSONA for a 10% discount). First run water over the brush, making sure to point the bristles with the flow of the water. Put some soap on the glove and work the bristles in a circular motion over several times. Next, rinse the brushes under water and lay them flat on a towel to dry overnight. 1. 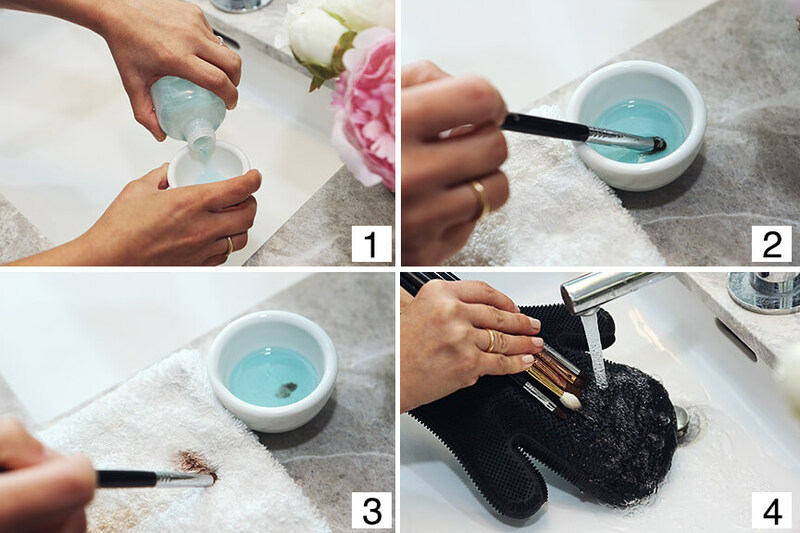 Apply a gentle cleanser to brush glove. 2. Work product into brush bristles. 3. Run the brush over glove in circular motions. 4. Rinse brush under water until all product has been removed then lay brush flat to dry. If you use the same shadows everyday, wash your eye brushes once a week. But if you like to switch shadows and palettes, obviously you should wash them in between to prevent unwanted color mixing. My eyes tend to be sensitive, and clean brushes prevent any irritation from bacteria or old makeup residue. To wash my eye brushes, I use a cleansing solution (I recommend Cinema Secret Brush Cleaner). Put a bit of solution in a small bowl and swirl brushes in the cleanser. Next, swipe your brushes back and forth on a towel to get rid of all leftover makeup. Rinse with water to remove any extra residue and lay flat to dry overnight. 1. Pour cleansing solution into a small bowl. 2. Dip brush into cleanser until bristles are saturated. 3. 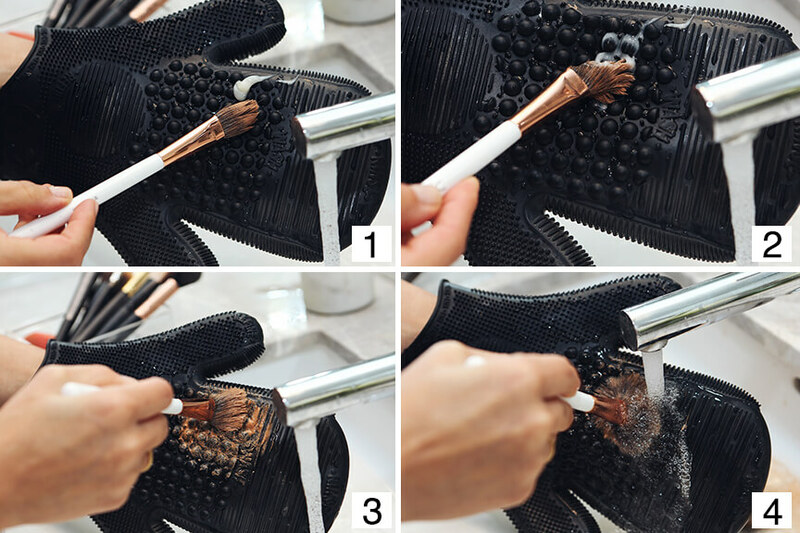 Run the brush along a cloth until all product has been removed from bristles. 4. Rinse brushes with water then lay flat to dry. I wash my beauty blenders after every use. You can buy a special solution, but I prefer to use regular dish soap. To wash my beauty blender, I first wet it and use a pump of dish soap. Massage the dish soap into the sponge and run under water to rinse, repeating until all the makeup is gone from the beauty blender. 1. Apply dish soap to palm of hand. 2. Work soap into beauty blender. 3. Apply water and massage soap into sponge. Run under water to rinse. 4. Repeat until sponge is clean. Lay flat to dry. I hope you guys got some good tips for washing your brushes! 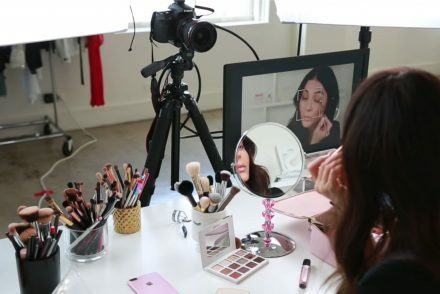 If you want to see what my 9 Must Have Makeup Brushes are, check out my absolute favorites here! Let me know if you have any requests for future posts in the comments below. Thank you for the tips! Love reading these kind of articles! 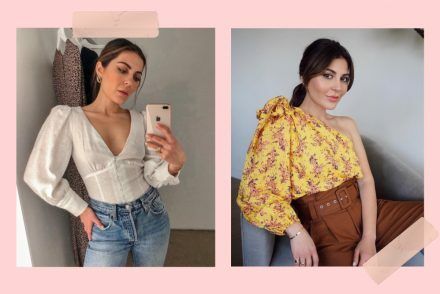 Do you have a “what should you have in your closet” video yet? ? Cleaning your brushes is so important – I use a $4 small silicone cleaning mat from Amazon. I don’t know the chances of you doing this but what are some of your tips for a great relationship with your boyfriend/husband. My boyfriend works a lot and I’m always at home with our 2 year old and I know bonding is important to keep a relationship alive and happy. What is something you and KB like to do for a fun date night or something to interact. My boyfriend and I are running out of ideas and we seem to be doing the same things over and over. Or I would love to see your key clothing staples for fall like shoes, jackets, tops, etc. Great post. But I want to see videos lol I’m missing them, once a week is SONAt cool HA! Thank you Sona for the tips! Now I’m relaxed, I think I’m doing it well. I use johnson baby shampoo for my brushes (the one for dark hair, because my brushes has dark hair. Those it have sense??? hahaha). Thank you Sona for the tips! Now I’m relaxed, I think I’m doing it well. I use johnson baby shampoo for my brushes (the one for dark hair, because my brushes has dark hair. Does it have sense??? hahaha). Thank you Sona, I don’t always comment but I always enjoy reading your blogposts .. Always very helpful ? Thank you so much sona!!! OMG I feel so special. Sending much love to you ???? Thanks for this post!! I will admit…. I am so lazy when it comes to washing my brushes. I need to do it more often!! I’m new to your blog but have been watching your videos for a couple months now. 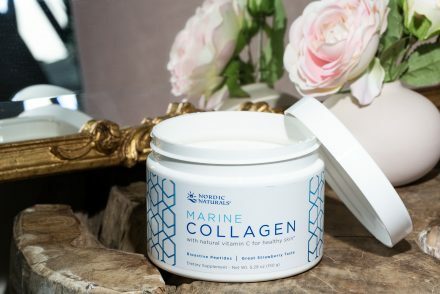 I’m wondering if you have a post about the best make up removers? Sona, could you perhaps do a video about skin tone vs skin undertone? Especially in terms of foundation, blush and contour and highlight? Dr Bronners bar soap works better than anything :) no more stained beauty blender! Loved this post! Thank you sona! #snapchatfam ? what’s the type of eyelashes you wear on this photography with urban decay lipstick please? Thanks for the tips! I definitely wasn’t cleaning my brushes often enough which would explain some of my eye irritation! Really loved this blog post Sona, thank you! I loveeeee the Cinema Secrets cleaner, I use it all the time!! I just have one question, how often do you throw out your beauty blender?? I wash mine after each use, but I wonder how often should I be throwing it out and getting a new one? Thank you so much for making this post! Absolutely loved it! You are my brush and beauty spoonge saver. These tips are so helpful you’ve done it again girl ???? Thanks so much for this post! I’ve been wanting to see how you clean you brushes. I saw recently a dupe for the cleansing glove swapping it for a lego base plate. I was wondering if you had tried it and could give us feedback. I’ve never tried any other glove but if it’s a dupe and it works, I’m all for it. Hey Sona! Was just directed here from your Q and A blog post. I use antibacterial soap and olive oil to clean my brushes. Is that okay? And if not how come?